" I found very many islands filled with people without number and all of them I have taken possession for their Highnesses... As soon as I arrived in the Indies, on the first Island which I found, I took some of the natives by force in order that they might learn and might give me information on whatever there is in these parts"
" They...brought us parrots and balls of cotton and spears and many other things...They would make fine servants...With fifty men we could subjugate them all and make them do whatever we want." Corte India, Corte Taina, Yo te llamo a Travajar. Corte Caribe, Corte Arawaque, Corte Ciboney, Yo te llamo a laborar. En los nombres de los Zemis, prestame tu bendicion..
COMMISSION OF THE INDIANS, COMMISSION OF THE TAINO, I CALL YOU TO WORK. COMMISSION OF THE CARIB, COMMISSION OF THE ARAWAK, COMMISSION OF CIBONEY, COME WORK YOUR SPIRITUAL LABOR. IN THE NAMES OF THE GREAT SPIRITS, COME AND BLESS ME. Before the Spanish set foot on the islands of the Caribbean, the indigenous people of Boriken (Land of the Mighty and Valiant Lords) later renamed Puerto Rico, and the Lesser and Greater Antilles, was the home to the peaceful Taino, and the Arawak, the warrior like Caribs, and a smaller group of cave dwellers known as the Ciboney. This race of people had a strong spiritual and religious foundation with many mystical beliefs. The Gods, where spirits of nature known as Zemis, or Cemis, with one head Cacique (chief) God named Yucahu and his mother Atabey or Attabeira . Other Cemis where nature spirits, great cacique chiefs and heroes who ascended into Cemis statues because of their valiant deeds. (Similar to Catholic saints). The mythology of the Taino was as vibrant and colorful, as those of Roman and Greek mythology. The tales of the Cemis, courageous Caciques, valiant heroes and ancestors were told in a feast known as an Arieto, and during nightly gatherings. The Cemis powers manifested on earth in stones, clay and wood, and all Cemis lived in mountains, plants, rocks, caves, rivers and forests. Yucahu or Yocahu, the Great Sky Father was the Cemi of the cassava root and creator of the Seas, who ruled over the skies and heavens. Itiba Tahuvava, wife of Yucahu, mother of the two sets of twins, From her came the man-bat who brought the season of dry weather and drought and woman-frog, who brought the season of rain. Bayamanaco the Cemi of Fire. Goiz: Cemi of the Breath of life. Boinaye, One of the sacred twins, The Opposing Forces, was the Cemi of Rain and earthquakes. Caguana, was the female Cemi who gave birth to the first humans. Savacu, Cemi of the rays of the sun and moon, a messenger. Márohu, Sacred twin The Opposing Forces. was the Cemi of calm weather. Guabancex Juracán The Hurricane Bringer was a female Cemi of winds and storms. 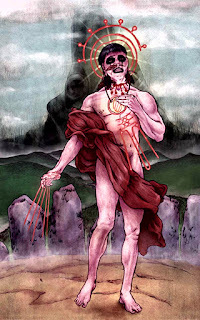 Guataubá, messenger of Guabancex was the Cemi who foretold of the coming of hurricanes, Cemi of thunder and lightning. Coatrisquie, the Cemi of waterfalls also created floods she also created torrential downpour. Hupia Hamáno, was the Cemi of the nightfall and the Moon, her children where the dead ghosts called the Hupia after her, who haunted the night. These spirits could not enter Coaybay for rest, the realm of the dead, and were stuck in this realm, similar to Ghosts. Moroyo was the Cemi of the rainfall. Ceiba, a Tree Spirit was the Cemi of the sacred tree, portal to the realm of the ancestors. Opiyelguabirán', Night Dog a Cemi that took the appearance of a dog, watched over the dead. Deminán Caracaracol was the Great ancestor, the father and heroe of the Taino nation who became a Cemi. Macocael a bird reptile Cemi of Caves where the first humans came from. 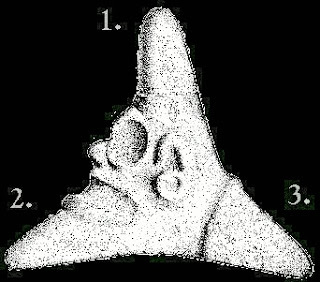 The paraphernalia of the Cemis, which where clay vessels, mortars, and statues carved on stone, wood, and sea shells where believed to manifest the powers of the CemisCemis or Zemis. One of the most popular Cemis paraphernalia was the Cemi Stone. The Cemí stone, with its three cardinal points, is a fundamental symbol in the Taino religion. The names of the three points are Yocahu, Hupia and Goiz. 1. On top of this sacred mountain peak, in the turey (sky) of the four directions, resides the Bohio 'hut" of Yocahu the Creator, whose name means that which has neither beginning nor end and which has no male ancestor or creator. 2. Coabey, is the underworld, the place of the dead. Here resides Hupia, the spirit of the dead. The face of Guayaba, the Chief of Coabey, is represented here. 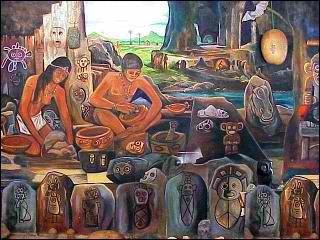 The Taino where a peaceful people, led by a Cacique chief who could be both male or female. The Bohiques where the priests who interacted directly with the Cemis in ceremonies or while in trance and the Bohuti, Buhuithu, or Buhuitihu were the shaman, witch doctors, and healers, who could speak with the Opia, the spirits of ones Dead, the Jukiyu-jan, the Ancestors and appease the Hupia ( evil spirits) With "tobacu" smoke, and gourd rattles known as Guiro, they could appease or keep at bay the Mabuya, the demons of nature, or banish the Cuqoh, (el Cuko) an incubus spirit that took the life of young children at night. The Taino had a belief that the souls of evil spirits roamed the night. This belief still exists on the island as every Puerto Rican knows about the "Cucoh" Cuko and the "Gwitona" Gritona (Llorona) female screaming spirit that haunts the island at night seeking to torment an unsespecting victim. Before the Buhuithu could mediate the will of the Cemis, spirits, souls or ancestors, they had to first relieve themselves of bodily waists and induce vomiting so that their bodies could not be grounded. Usually the Buhuithu fasted for many hours and did not consume food until their Spiritual labor was done. The Bohiques in keeping with oral tradition of a mythology of how the son of Yaya by the name of Yayael tried to kill him so he could reign supreme over the other Cemis, and was killwd in battle. Yaya feeling great remorse for being responsible for the loss of his son, kept Yayael's bones in a gourd with symbols of the Cemis. From this gourd, the ocean and fish where created. The Buhuitihu on his batey kept a gourd filled with bones of an ancestor, roots, tree barks and stones which where sacred to the Cemis. The Cemis where also carved into wooden figures or sacred stones, as it was believed that the Cemis manifested their powers within them. These carved stones and wooden figures of the Cemis were kept in the bohios ontop of a batey by the Bohiques and Buhuitihu. These where the ancient altars, that are still very influential in Brujeria altars thoughout the Americas. This influence can still be seen today in Puerto Rico. 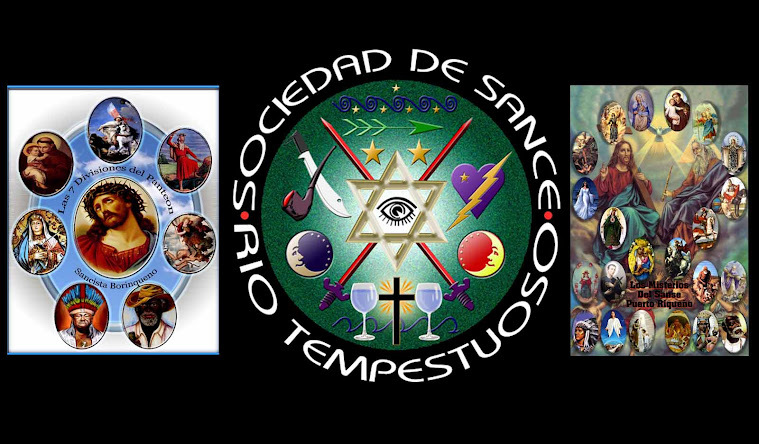 While many Santeros in Puerto Rico are those individuals who are initiated into the priestly order of Cuban Lukumi Santeria. It is important to understand that a Santero can also be considered an artist who carves figures of Saints into wood, a tradition of the Taino that still survives till this day. If you ever visit Puerto Rico, purchase one as it will make a powerful addition to your altar. 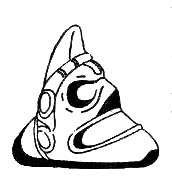 There where four class groups in a Taino clan, the Cacique or Cacica was the head chief, followed by the Bohique (priests) the Buhuithu, (Shamans) the Nitaino, the defenders and warriors of the clan, and lastly the Naboria, which were the common folk. 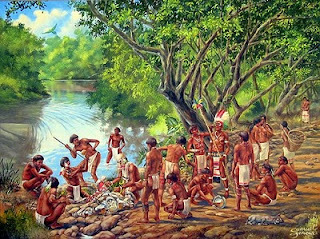 The Taino were a very clean race, cleansing, bathing and purifying their bodies twice a day, when the Spanish came, they forbid the captured Indians to bathe frequently, at the time the European people believed that bathing frequently meant loosing a piece of ones soul, in the process cutting in half one's life span. While many Taino men where killed, mostly by foreign diseases or in battle, the women that survived where taken as wives, these women gave birth to the first Meztisos. While the Spanish men took care of searching for gold, trying to find the mythical fountain of youth, or in battle with native and surrounding tribes, the Taino wives who were baptized into Christianity did not completely forget or abandon their traditions and beliefs. Similar to the African slaves they hid their ancient Cemis in the disguise of Catholic saints. In time the ancient Cemis names where forgotten, but the many of the characteristics of these Cemis remained in the Catholic saints. The language of the Taino into English words. Although Caribbean people use many Taino words in their Creolle dialects many Taino words are used in english as well, Hurricane, barbeque, hammock, potato, tobacco, iguana. and canoe all are of Taino origin. Also Americans favorite past time, baseball came from the Taino, its a wonder why many great baseball players are from the Caribbean. Words such as Batu, the game itself, the batey, ceremonial ground where game was played and the Bateh, the club used to hit the ball. Abey : Cacique of Salinas Puerto Rico. 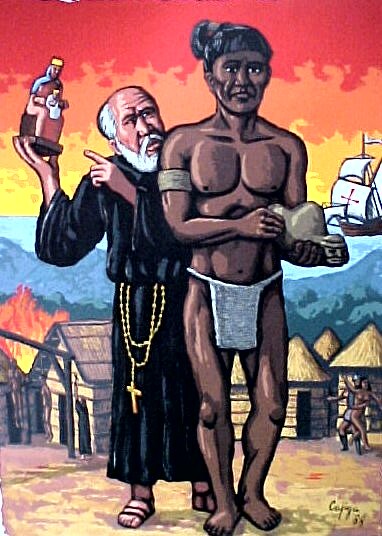 Agüeybaná: The Cacique who greeted Juan Ponce de Leon. Aramaná: Cacique of the Coa Toa River region. Arasibo: Cacique of Arecibo, Puerto Rico. Aymamón: Cacique of Culebras Island Puerto Rico. Cacimar: Great Ruler of Bieques, Viequez Island Puerto Rico. Dagüao : Cacique of Naguabo, Puerto Rico. Iniex: Baptized by Juan Ponce de Leon, under the name, Doña Ines. Mother of Agueybaná. Guacabo: Ancient Cacique great ruler. Güamaní : Cacique of Maneti, Puerto Rico. 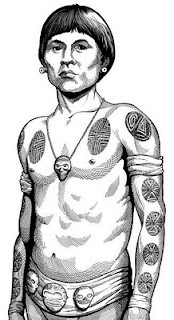 Güaraca: Ancient and legendary Cacique chief. Guaybana The Cacique that led the Taino Rebellion of 1511 in Puerto Rico against the Spanish settlers. Loquillo: Puerto Ricos last Cacique, who died in battle against the Spanish. Urayoán: the first Cacique to order the drowning of the Spaniard, Diego Salcedo to determine if they where truly Gods. Yaureibo: Cacique of Vieguez who died in battle fighting the Spanish. Yuisa: The Taino Cleopatra, last Cacica of Puerto Rico. Married the Mulatto Pedro Mejias. Killed for being a traitor, but legend says she wanted peace with the Taino and Spanish. Yuquibo: el loco and invincible one, Cacique who got away with many attacks and raids on the Spaniards. After death he became a Cemis, one of the last to reach this statues. OH, Gran Cacique, fidelísimo espíritu Indio Celador de tu morada. En el nombre del Padre, del Hijo y del espíritu Santo; yo, fiel creyente de tu poder, te invoco en este momento, ya que Tu, Gran espíritu Indio, conoces las aflicciones de mi materia para que intercedas con nuestro Padre Eterno y me brindes tu santa y divina protección. OH, gran espíritu Indio, tu que eres el encargado de brindarme protección, te pido en el nombre de Jesús, que con tu hacha de piedra rompas las malas cadenas que mis enemigos me tiendan, materiales y espirituales. Con el veneno de tu flecha, OH, Gran espíritu Indio, destruyas los malos pensamientos que en contra de mí vengan. OH, Gran espíritu Indio, contus ojos deáguilavigila misendero. Que no haya brujo, cirio, lámpara ni mal pensamiento que pueda hacerme daño corporal o material. OH, Gran espíritu Indio, te dedico esta luz en pago de tu protección, para luz y progreso de tu santo espíritu. Amen. OH GREAT CACIQUE, INDIAN CHIEF, MOST LOYAL AND FAITHFUL SPIRIT. IN THE NAME OF THE HOLY TRINITY, FATHER, SON AND HOLY GHOST. I A FAITHFUL BELIEVER IN YOUR POWER, ASK YOU IN THIS MOMENT TO HELP ME. OH GREAT SPIRIT, YOU UNDERSTAND MY SUFFERING, HELP ME WITH YOUR POWER AND GUIDE ME WITH YOUR HOLY AND DIVINE PROTECTION. OH GREAT CACIQUE CHIEF, I ASK YOU IN THE NAME OF OUR LORD JESUS, OFFER ME YOUR PROTECTION, WITH YOUR STONE AXE, AND HATCHET, BREAK THE CHAINS MY ENEMIES HAVE FORGED FOR ME. BOND ME WITH YOUR DIVINE SPIRITUALITY AND CLEANSE MY SOUL. WITH THE POISON OF YOUR ARROWS, DESTROY THE EVIL THOUGHTS AGAINST ME. WITH YOUR KEEN SIGHT OF THE EAGLE, WATCH AND DEFEND OVER MY HOME, MY FAMILY AND ALL I HOLD AS SACRED. LET NO SORCERY, CURSE, ILL WILL, HEX, BAD THOUGHT OR ACTION FROM MY ENEMIES HARM ME. I LIGHT THIS CANDLE IN YOUR HONOR. MAY YOUR SPIRIT FIND ETERNAL PEACE, ENLIGHTENMENT AND CONTINUED ADVANCEMENT. AMEN. O gran Cacique, tu que vencistes en la tierra, con tu flecha sagrada destruistes a tus enemigos. Ven hacia mi y ayudame sacar de mi cuerpo estos espiritus sin luz y aleje a todos estos malos pensamientos que rodean sobre mi. Oh Gran Cacique, Indio Poderoso! Con las facultades que nuestro Señor Dios Todopoderoso te brindo, ayudame a progresar en esta vida, y derme la dicha de vivir en paz. Y al que se aponga gritare. GUASABARA, GUASABARA, GUASABARA! OH GREAT CACIQUE, INDIAN CHIEF. YOU THAT OVERCAME THE OBSTACLES SET IN LIFE. HELP ME TO OVERCOME MINE. WITH YOUR BOW AND ARROW, YOU DEFEATED YOUR ENEMIES. HELP ME IN REMOVING THE SPIRITS THAT WISH ILL FROM MY PATH. REMOVE ALL EVIL INTENTIONS FROM MY PATH. OH GREAT CACIQUE, POWERFUL INDIAN. WITH YOUR SPIRITUAL FACULTIES THAT HAVE BEEN GRANTED UPON YOU BY OUR LORD GOD, HELP ME IN PROGRESSING IN THIS LIFE AND THE NEXT. BESTOW UPON ME THE DIGNITY TO LIVE IN PEACE. AND TO ALL MY ENEMIES WHO ALSO I SHALL CRY THE WAR CRIES OF YOUR PEOPLE. GUASABARA! GUASABARA! GUASABARA! Guakia Baba turey toca, Guami-ke-ni, Guami-caraya-guey guarico guakia tayno-ti, bo-matun; busica guakia aje-cazabi; Juracan-ua, Maboya-ua, Jukiyu-jan; Cemis Yocahu, nabori daca, Jan-jan catu. Our Father who touches the skies, Lord of the land and the seas. Lord of the Moon and the Sun. Come to us, standing tall, and full of generosity. Give to us our daily nourishment. Keep away bad spirits. Keep away Ghosts. But bring forth our good spirits. Yocahu I a humble servant, ask that you listen to my prayers. So be it. While many states follow the day of Christopher Columbus, every Latin American country celebrates, El Dia De La Raza, or Day of the Race. This day falls on October 12th. Recently many Espiritistas and Brujos hold this holiday as sacred and hold a public Fiesta Espiritual in honor of the Indian Spirits. Traditional Taino food is served such as Yuca with Codfish and Casava bread. Music is played and the Indians are invoked to come down and dance and lift Causas. A few years ago to celebrate el Dia de La Raza, I brought two friends, a Colombian and a Venezuelan to two Taino ceremonial grounds on the island, the larger Tibes Ceremonial Park in Ponce, Puerto Rico and Caguana Ceremonial Park in Utuado, Puerto Rico. Although the Tibes was much larger with many Batey, a collection of live turtles, and many stones etched with Taino and Cemis symbols. The thing I loved about the smaller Caguana Ceremonial Grounds was the Tres Picachos hills, believed by the Taino to be the point where God created life on the planet. If you meditate at the vista on Tres Picachos, you will see the resemblance of the sacred Cemis stone. The Code of Puerto Rican Santerismo and Brujeria.